I was looking for something to describe my mood today, and there it was. Simply stated by a brilliant man, and there on the “Perpetual Optimism” Facebook page. We keep going because we have to. We keep going because if we DON’T, then we will fall. 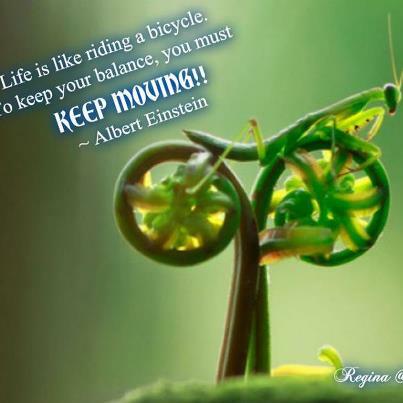 We keep going because it is the only way to keep our balance. I am tired. Tired of running, and sorting, and organizing and doing – all the time. Tired of working full time, being a full time Mom, and being a full time researcher, full time medical billing secretary, and a full time organizer… of all things. I am not perfect at any of those jobs, and that frustrates me more. I want to do them all perfectly, but there is precious little time to pause for fear I might lose my balance. I am grateful. For my husband and my daughter. I was never very good at riding a bike. Now that I do it full- time, they are my training wheels – always ready to hold me up… just in case.